Let's face it, I'm nowhere near the weight I want to be. Before I was a mom and pregnant with Noah, I was pretty skinny. I gained fifty pounds during my pregnancy. I lost about half the weight after he was born but the rest is still there. As I am getting older I am gaining more weight. Many people don't have time to do elaborate diet plans and exercise regimens. I try to walk around my neighborhood a few times a week but I am still struggling. I am trying to eat healthy as much as possible. 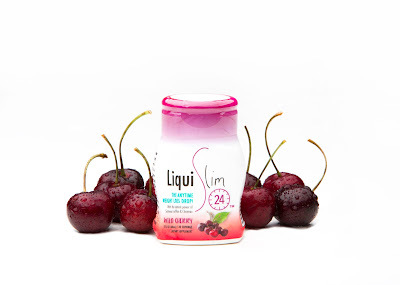 I learned about a product called LiquSlim 24 and thought it sounded interesting. It's a water enhancer that promotes weight loss. You just put it in your water and go about your day. It helps your body cut cravings. I work from home so my entire kitchen is at my disposal. I find myself grabbing chips or candy whenever I want something to eat. It also is a mood booster that can improve your mood. A good mood is something we all strive to have every day. LiquiSlim 24 also helps you drink water which is vital in a healthy lifestyle. I love that it comes in Wild Cherry. LiquiSlim 24 is great on the go. You can throw it in your purse or car and have it with you any time you want. It's recommended to drink a glass of water with Liquislim 24 twenty minutes before you eat. It's so easy to overeat especially if your food tastes good. I am bad with portion control because I love to eat. My friends tease me because I am always thinking about food. I plan meals out weeks before I go on vacation. LiquiSlim 24 helps me with mindful eating. LiquiSlim 24 is a brand new crave-busting and mood-boosting weight loss drop. The on-the-go water enhancer contains no thermogenics, caffeine or other stimulants, which gives you the freedom to use it anytime, anywhere. LiquiSlim 24 features two clinically tested ingredients; Satiereal® saffron and chromium picolinate (Chromax®CrPic), which help aid in weight loss, help diminish carb craving, help control blood sugar levels and promote a healthier and happier lifestyle. I love that it's stimulant free. I have trouble with taking weight loss products because I am always worried it will make me go crazy. One of my favorite movies is to blame for that. I feel good about using LiquiSlim 24 because it doesn't contain caffeine or anything I feel that can become addictive. I also like that there is no pills or tablets to take. You can use it anytime day or night. Hunger doesn't seem to know how to tell time. It's only $17.99 a month which is so much cheaper than most weight loss products. It's affordable for any family. For more information please visit LiquiSlim 24.